The Ericales are a lairge an diverse order o dicotyledons, includin for example tea, persimmon, blueberry, Brazil nit, an azalea. The order includes trees an bushes, lianas an herbaceous plants. Thegither wi ordinary autophytic plants, the Ericales include chlorophyll-deficient myco-heterotrophic plants (e. g. Sarcodes sanguinea) an carnivorous plants (e. g. genus Sarracenia). Mony species hae five petals, eften grown thegither. Fusion o the petals is a trait that wis tradeetionally uised tae place the order in the subclass Sympetalae. Mycorrhiza is an interestin property, frequently associatit wi the Ericales. Indeed, the symbiosis wi ruit fungi is quite common amang the order representatives, an thare are even three kinds o it which can be foond exclusively amang Ericales (namely, ericoid, arbutoid an monotropoid mycorrhiza). In addeetion, some faimilies amang the order are notable for thair exceptional abeelity tae accumulate aluminum (Jansen et al., 2004). Ericales are a cosmopolitic order. Auries o distribution o faimilies vary lairgely - while some are restrictit tae tropics, ithers exist mainly in Arctic or temperate regions. 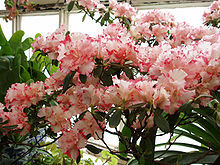 The entire order contains ower 8000 species, o which the Ericaceae accoont for 2000-4000 species (bi various estimates). This page wis last eeditit on 12 Julie 2013, at 16:09.